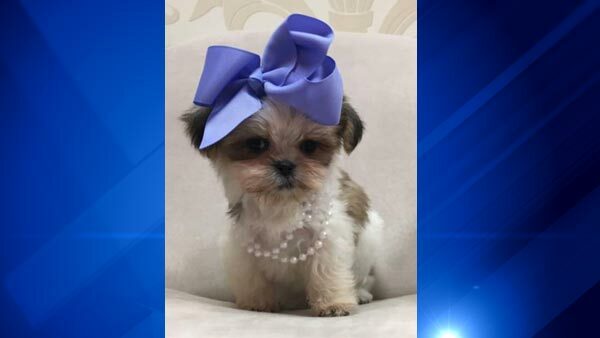 JOLIET, Ill. (WLS) -- A 10-week-old Shih Tzu was stolen Wednesday from a store in southwest suburban Joliet. Furry Babies, a store in the Louis Joliet Mall in the 3340-block of Mall Loop Drive, reported the stolen dog on their Facebook page Thursday. The puppy, worth several thousand dollars, was stolen at 7:51 p.m. Wednesday while the store was busy. Surveillance video shows two people walking up to the crib where the puppy was sitting before the man reaches down into the crib and puts the puppy under his coat. "We are worried sick about the puppy's well being and want her safely back in our care," wrote Furry Babies Joliet in a Facebook post. The post said the store is offering a cash reward for the puppy's return. Anyone with information is asked to contact Joliet police (815) 577-9800.